With two self-employed busy parents running start up businesses in our home, taxes, business receipts, organizing a family of five, a middle school son in sports, and a home to keep up with, we’ve got paper clutter in the house! Surprised? I’m guessing not. Heh heheh. Last January when I embarked on my home transformation, one of the main things I was interested in was revamping how we used our home. Not just making it pretty, but figuring out how to best use the space we have and creating systems that actually work for us. One of the first systems I set up last year was our magnetic “command central” board in the little hallway by our kitchen (just outside of my office). I found the board at Costco last year (see a few similar ones at the end of this post)! While my hallway wasn’t the cutest area ever at the time, nor was it the big giant mudroom space I dreamed of having, nothing has to be perfect in order to be functional. Right? So, I hung my magnetic chalkboard and started using it. If you wait for perfect circumstances, you might never get organized! It was a “good enough” command central. After a year of experimenting with how to use it (and several months of missing being able to use it due to the remodeling! ), I can officially say two things about the board. 1) My hallway where it hangs is quite a bit more cheery and cute now than it was last year, if I do say so myself. I know it’s kind of superficial but when something looks especially fresh and pretty, I’m more inclined to use it. That’s just me. Weird quirk. While I originally planned to stencil that wall, I ultimately decided what I really wanted was a nice solid wood planked surface to hang my board from. You’ll get to see more of the makeover of this little hallway that leads into the kitchen very very soon! It’s very tiny but I think it’s got quite a bit of personality now. It makes me smile every single day! 2) The second thing I can say about our magnetic board is — it’s now REALLY working for us. And that is huge. At first we used it as a visual calendar. And while that was super helpful to keep our schedules organized, I think I like how we use it now even better. We have iphones and computers and day planners for calendars, but the biggest issue we had in our home wasn’t schedule issues. It was LOST IMPORTANT PAPERS. Oh my word, people, I cannot tell you how many important papers we have lost after they have been shuffled off to the mystery place where missing socks and wayward papers go. The all time worst was during the remodeling when we couldn’t use our board and nothing in our house was not where it belonged. Oh the funny stories I could tell you, but I’ll save them for another time. So what exactly is this board for? This board is functioning as family paper central, the landing place for the urgent papers of life. It’s our “Take Action!” board. Now that the remodeling is done, our primary focus is on making our home useful, comfortable to live in and organized for day to day living. Our house is not that big so every inch has to count! Even though this is a teeny little hallway, four feet of magnetic chalkboard is all we need to make sure we can keep track of upcoming game schedules, important lists of things we need to remember, mail we need to deal with, forms we need to sign, bills that need to be paid, business cards of people we need to contact … whatever we need to keep track of RIGHT NOW, it goes here! This is not a filing or storage system. It’s not an inspiration board. It isn’t a place to show off my son’s awards or for family photos. This is not a place to store menus or anything at all random like that. It is strictly a board for the urgent paper or things we need to remember or take action on in the near future. And that is exactly what we needed in order to maintain our sanity and keep us organized. We also use our chalk pens to write important reminders, such as new basketball practice days or any thing else coming up that we might easily forget. I’m an ‘out of sight, out of mind’ kind of girl so using a file box or drawer for urgent papers is never a good idea for me. I need to SEE what I need to do! We also use the board for bigger organizing projects, such when I was organizing papers for taxes. It was a life saver to clip important papers up on the board until I was ready to put them away, rather than have them get lost in a file or stack of papers. 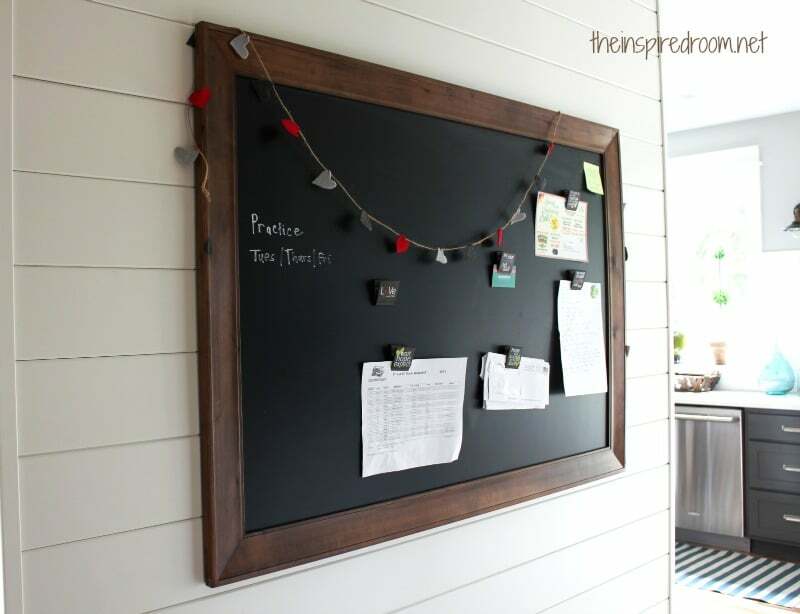 I love the big magnetic clips (you can find them here, Urban Soul by Red Letter Words at Dayspring) and they come on a magnetic board you could use in a similar way to my large board!). The clips are perfect for clipping together related items like bills or receipts! Looking for a big board like mine? 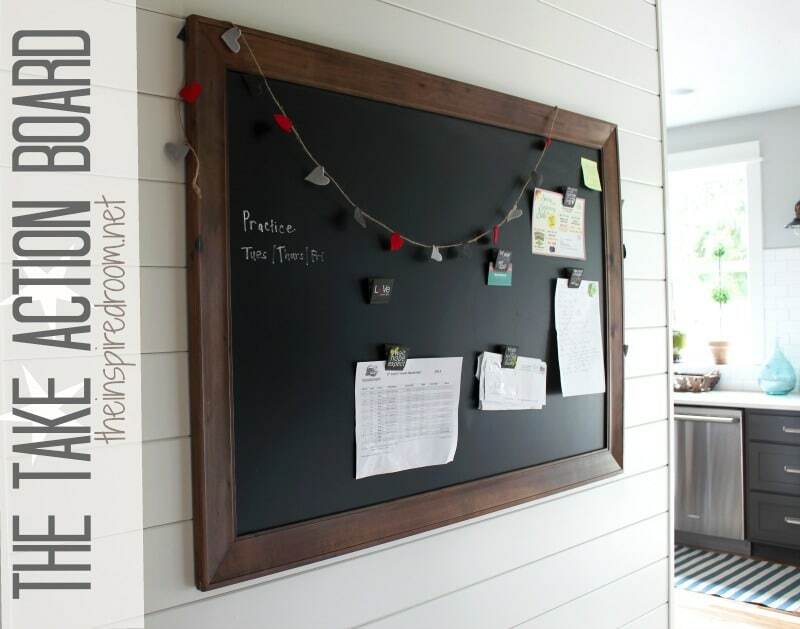 I’ve seen similar magnetic boards online here, Amazon, and at Ballard Designs (some affiliate links used). Once I’m ready to deal with the papers on the board and action is taken, papers are moved to file cabinets or shredded or scanned to computer files. But while they are still in the “take action” phase, this board is where they stay, never to be lost again. Yes, we could go to a “paperless system” but honestly, that is sometimes more trouble than it is worth to me. While this system might not work for everyone, it sure works for us right now! I’m feeling much more organized and less frazzled! Do you struggle with paper organization? Paper clutter is pretty much the worst! My desk is usually covered in miscellaneous papers! I love it. I’m always losing papers between my kitchen desk and our office. I want one now. What a wonderful idea! I can so relate to the paper issue! I guess that is what my small board in my kitchen is “a take action board”. Love that name. My biggest problem is cleaning it off and putting away the ‘DONE’ pages and making room for the next LOAD of ‘action’ papers! I love this board and that and the plank wall. Can’t wait to see it in it’s entirety! I have a horrible habit of putting important papers away and then forgetting they exist. I try to put everything into my phone, but it doesn’t always happen. I tried a board like this in the office, but I realized I don’t go in there enough to make it work. Still trying to figure out a good spot! What a great idea! I have a huge whiteboard on the wall of my home office for our monthly calendar, but organizing the papers would be a fantastic addition to organizing my home. Going to get one of these NOW. (I would write a reminder on a post-it, but I’d probably lose it). Paper clutter is a major challenge for us and I have a “needs attention” basket inside my kitchen office station…but I always forget about it and it never gets the attention it needs! I have been wracking my brain for ways to make our busy household function more efficiently and have thinking about turning a hall closet into a mini-office command central. Your big magnetic board has inspired me! And I LOVE your BEAUTIFUL plank wall – we have similar paneling going up in our laundry room during the next week. Yes!! I am the same way, especially about bills or permission slips. I need an honest-to-goodness in your face physical piece of paper to remind me daily to take action. The side of our fridge is black and (of course) magnetic, so it serves much the same purpose as your take action board here. One thing I might recommend you consider adding to yours is a magnetic pencil cup. There are several stylish ones out there and don’t cost much. I couldn’t live without mine. Keeps pens at the ready where they are needed and helps with highlighting due dates and such. Kudos on your system! Love the view of the kitchen around the corner there! Me too, I need to see that paper in front of my face or I won’t deal with it! Good idea on the pencil cup! Our pens are right around the corner so not too hard to reach, but I like the idea of a magnet cup, good tip! i think i might have to do this… now! i am always spreading my action item papers out on our kitchen counter (near the back door) so that they aren’t forgotten. a large board on the wall, incorporating the calendar would be perfect! so excited… i remembered that i have a 3’x2′ chalkboard w/frame that was in my elder spawn’s room and i was saving it to use in younger spawn’s room, but would be much better for this purpose. i just have to magnetize it, and you posted about doing that a couple years ago, so i’m all set. oops… shoulda read that post first. hmmm. will have to find another solution. I absolutely love this idea and the size of the board and the wonderful clips (thanks for letting us know where to get them)! Now I just have to determine the perfect spot for my very own action board. I am still trying to put my papers in order! That’s a pretty good idea. The point is to find the most suitable place to put the board so that to be more useful. thanks for the post!!!! It’s a pretty neat idea. Wish I had a good place to put a board like that. I might have to think of something. We use magnetic chip clips on the side of the fridge to keep active papers. With two kids one year apart they both have snack days, field trips, school dances fundraisers and sports and so much more.